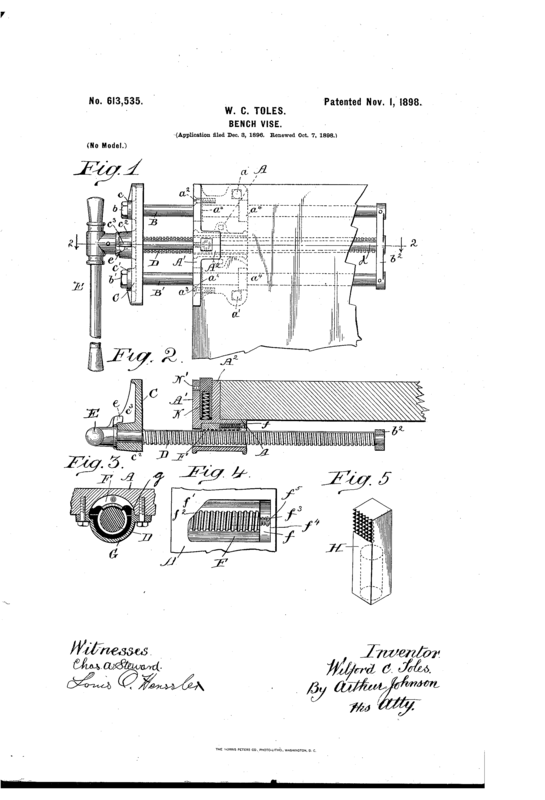 … it turns out that Steel Nut & J. Hampton ltd (aka Woden) filed a patent in 1906 that aimed to resolve potential issues with the cast sliders first used by Parkinson (they suggested adding rollers to reduce wear and friction). I doubt it ever got made, though, since US manufactures had already come up with the better idea of using steel rods as guides for the moving part of the vice and this eventually got adopted in the UK also. The advantage of this particular quick-release mechanism is that it allows you to rapidly adjust the position of the jaws and then grip the work-piece without changing the position of your hand on the handle. You turn the handle counter-clockwise to engage the QR and clockwise to grip. There is a slot running down the length of the screw where the screw thread is cut away (this slot is slightly wider than the thread in the half nut) and when the nut engages with the slot the jaws are free to move. There is a second later patent (1896) that shows a slightly modified design of the half nut. If you look closely at the pictures of the dismantled vice below you will see a small nib on the top of the green collar that receives the handle and a matching projection on the face of the vice above the central hole where the screw is inserted. These nibs mean the vice will not work as a conventional screw vice, instead the handle is brought up until the nibs engage (at this point the part of the screw with threads removed is aligned with the nut) to move the vice in or out. Once the jaws have been pushed close to the work-piece the handle is rotated the other way to cinch up the jaws tightly. The oddly shaped half nut is designed to move in a way that makes it easier for the threads to realign after they have been disengaged in ‘rapid action’ mode. The same quick release mechanism was used in Morgan ‘rapid action’ vices. The company was bought by Milwaukee Tools who still make a quick release woodworkers vice which although visually similar does not use the same mechanism. I did read they can still supply the nuts to fit the older vices though, which is pretty cool. Melhuish, a famous tools merchant based in Holborn, offered both the Parkinson and Toles vices in their 1905 catalogue (see second and third illustrations below). Despite being an inferior design (the Parkinson asks both as a ‘rapid action’ and continuous screw vice), the Toles was nearly twice the price, which may explain why they are very hard to find in the UK. Incidentally, the first vice shown (no 772) in the Melhuish catalogue was made by Entwistle and Keynon – keep an eye out for a post about this vice later in the series.